Laboratoire Matière et Systèmes Complexes - Séminaire Interne MSC, 10 décembre 2018 11H30 en 454A. Camille Gaulon & Quentin Roveillo, "Sound in foams" & "Confinement of active particles in a 3D liquid foam"
Accueil du site > Séminaires > Archives séminaires > Séminaires 2018 > Séminaire Interne MSC, 10 décembre 2018 11H30 en 454A. 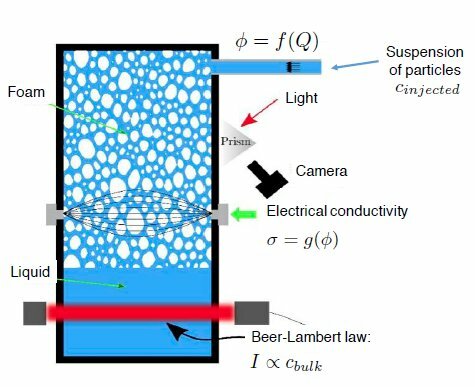 Camille Gaulon & Quentin Roveillo, "Sound in foams" & "Confinement of active particles in a 3D liquid foam". Double séminaire-interne du laboratoire MSC, lundi 10 décembre 2018 en 454A à 11H30. In the last few years, liquid foams have revealed surprising abilities to reduce sounds. The liquid skeleton, made of soap films and liquid channels, can vibrate due to the acoustic excitation. At low frequency, the two elements (films and channels) oscillate together, whereas only the films move at high frequency. In between, a resonance effect is observed with a maximum of attenuation. We decided to investigate more in details the dissipative mechanisms in liquid foams, in the audible range. Besides, soap films play a key role in the acoustic behavior of liquid foam, especially concerning sound attenuation. Yet, materials used for soundproofing, like solid foams, usually have no membrane : no obstacle should prevent the sound to penetrate inside the medium, otherwise the acoustic energy would be reflected back instead of being absorbed. So, what about the case of a solid foam whose cells are closed with thin membranes (the equivalent of soap films in liquid foams) ? That’s exactly what we are studying. Inspired by the problematic of the trapping of planktonic organisms in marine foams , we measured the sedimentation dynamics of a motile micro-algae in a laboratory-generated foam. A liquid foam is made of air bubbles separated by a continuous network of liquid microchannels. Initially the liquid is equally distributed along the height of the foam. Then during the experiment it drains in time out of the foam under the effect of gravity and capillarity. If present in the liquid phase, solid particles are either advected downwards by the flow or trapped in the foam, depending on their size and concentration . We use a model single-cell algae, Chlamydomonas rheinardtii . The algae is homogeneously incorporated in the liquid phase of a foam, buoyant on top of its liquid phase and we measured the temporal evolution of the number of algae released from the foam in the underlying liquid. C. rheinardtii is bi-agellate, thus motile. We investigated the effect of motility on the transport of algae through the foam, using motile and non-motile (dead) C. rheinardtii, and we show that motile algae are more likely than non-motile to remain trapped in the foam. B. Ha_ner et.al., J. Colloid Interface Sci. 458 , 200-208 (2015).